Adventures in Motoring: Covers completed (well almost). The pace of any modification seems to be stilted, you have a rough idea of what you want to achieve, then you have the reality of what can be achieved so you adjust your thinking and budget accordingly. Put said plans into action, rushing here, sourcing there and then wait. Small bursts of activity followed by, well nothing much, just hanging around really. It's usually in the periods of 'hanging around' I like to think I'm at my most dangerous to the budget, as the original plans change in the early phase or at least the larger items are sourced, my attention starts to turn to all manner of smaller items and it is normally here where the budget slips on such odds and ends like pipework or even screws. One source of amusement for me to play with has been the clean up and finish on the RB26 covers. As posted previously the front pulley cover needs to be modified for the Variable Valve Timing which sticks out the front of the RB25 engine. I also wanted to go with a classic feel for the engine itself and being of advancing years I recall from my youth that anything 'cool' would feature a red top engine. Just say no to flip paint, to manga girls in states of undress and Japanese flags. Oddly enough you would think it easy to get a rough finish crackle powder coat although there are not a lot of places who actually do it. Eventually I found Maldon Shot Blasting who do a lot of restoration work on classic cars. It's pretty important to remember that not all powder coaters are equal at this point, what works for your garden furniture does not always hold true for your pride and joy. Otherwise this is known as 'getting what you pay for' (crap is crap). Anyway onto the main course.. 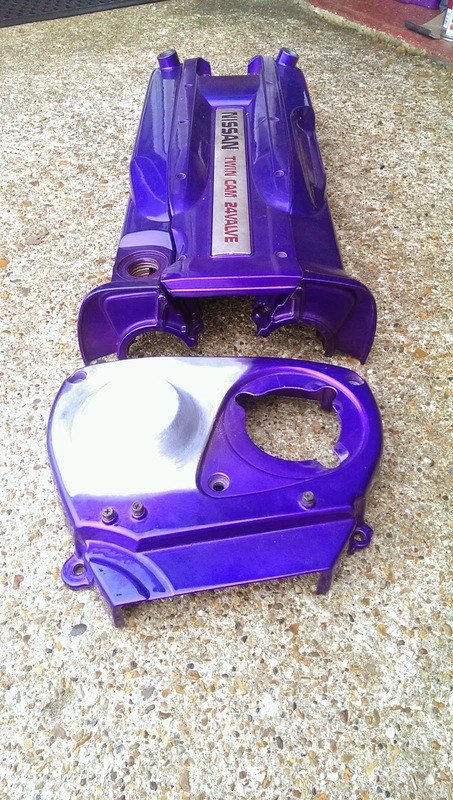 I started out with some respectable second hand covers that had already been well painted in a flip HKS type purple. As you can see from the photo the front cover was then modified to take care of the VVT bulge and the ghastly RB26 was sanded away. 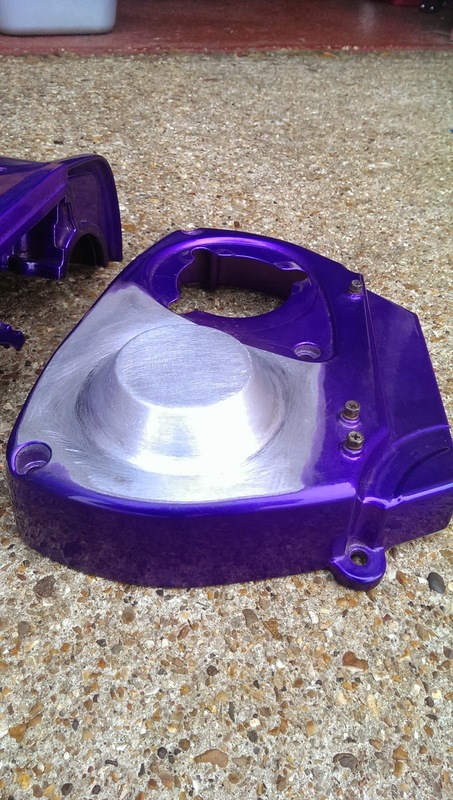 Original RB26 covers after front cover modification. At this stage I started to look around for a replacement 'Nissan twin cam' ornament as the original was showing some small sign of age. I also managed to drop it, dinging a corner. If you want a new cover, good luck.. Although Nissan's of Chesapeake in the USA have some (I don't mind letting you know as I have mine now). Close up of front cover modification. It was pretty important to me that I retained the original look and feel of the RB25 front cover 'bulge', ironic as it is difficult to reproduce a pressing, however the result is pretty stock looking. 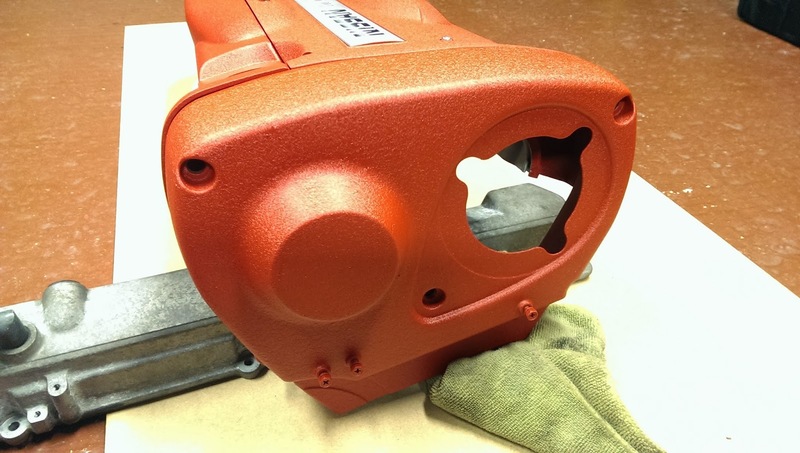 The finish up close of the crinkle powder coating. 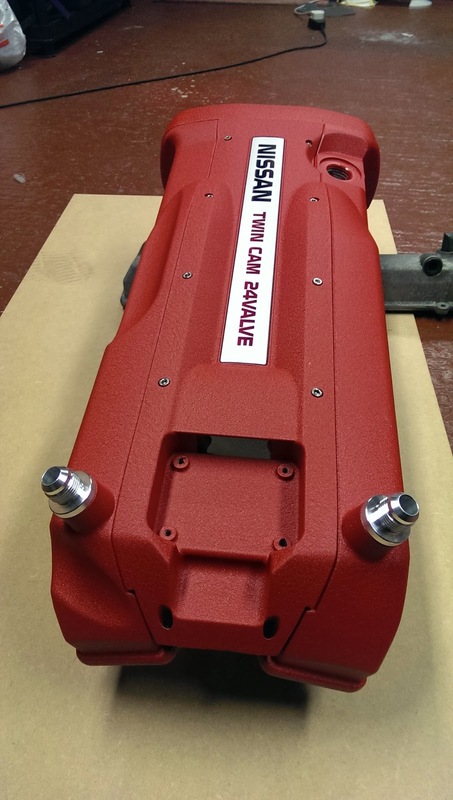 Text from Malden's web site..
Maldon Shot Blasting & Powder Coating Ltd. now offers a new Crinkle powder coating system for a variety of cam covers and engine parts in Black or Ferrari Red. 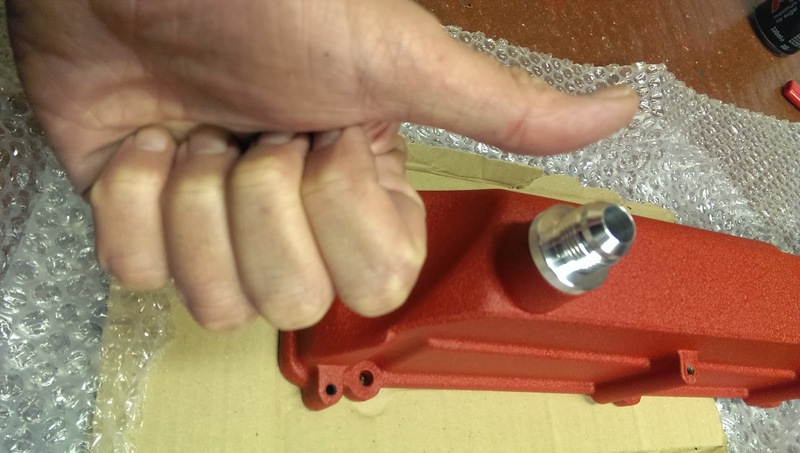 This new system has been approved by three local car restoration companies, JD Classics, Fox Hoyle Racing & Jennings Engineering. 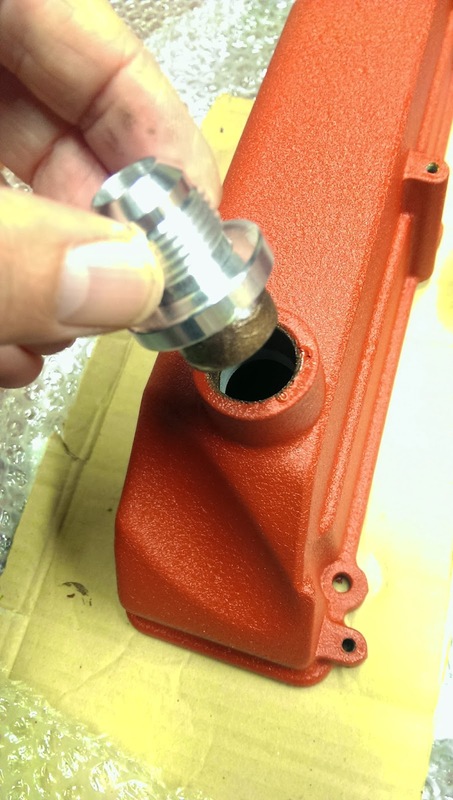 Our work is carried out to a very high standard; for instance cam covers are chemically stripped (no acids are used) then washed and ultra cleaned in our phosphate plant, threads and inner chambers are then masked off. 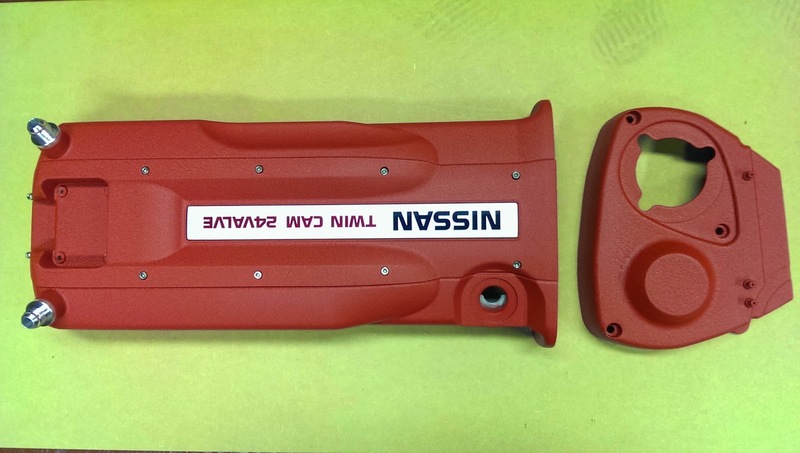 Some clients require us to mill off raised areas of the work such as logo’s and ribbed parts for a better effect. This can be done in two ways, either by a simple D.A fine sanding of by milling. 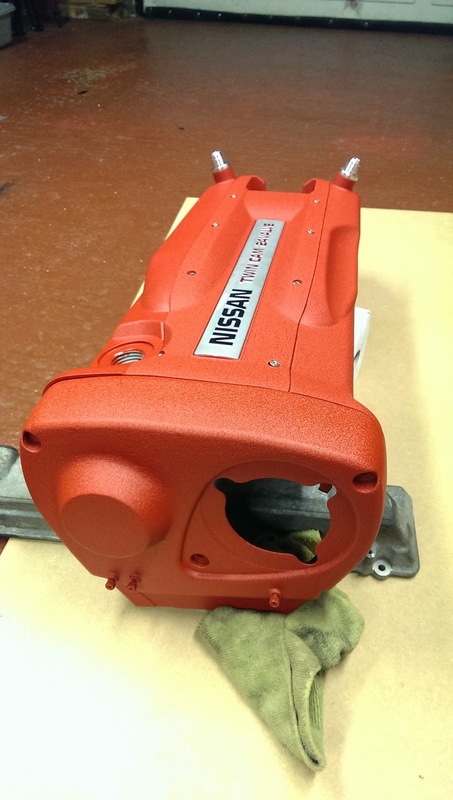 Milling leaves a far superior surface, however this will add further costs to the work as a local engineering company carries out this work on our behalf. 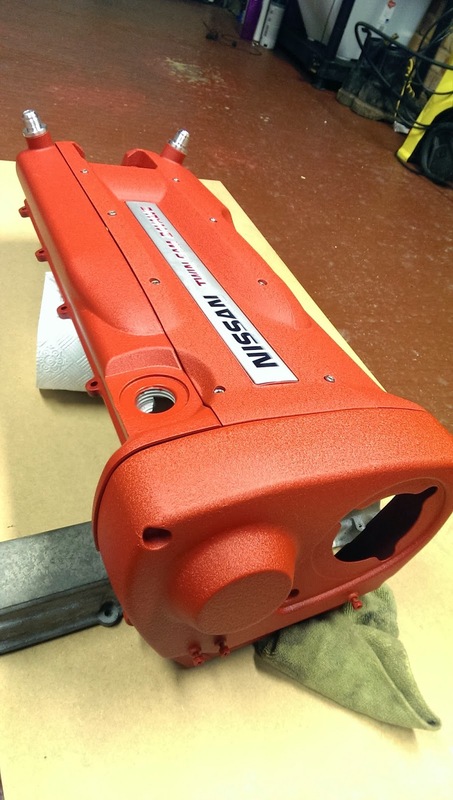 If you are interested in this new powder coating finish, we would be happy to run a small sample, using parts supplied by the client. Sample swatches can be supplied on request. Overall view of covers with ornament plate and AN10 fittings. Fitting the AN10 bungs. 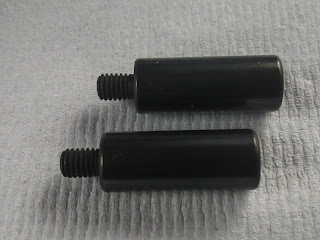 These are supplied slightly oversize for a tight press fitting. However you don't have to worry about hiring a giant press to fit them! I used some copper slip for lubrication on the shaft and inner diameter. 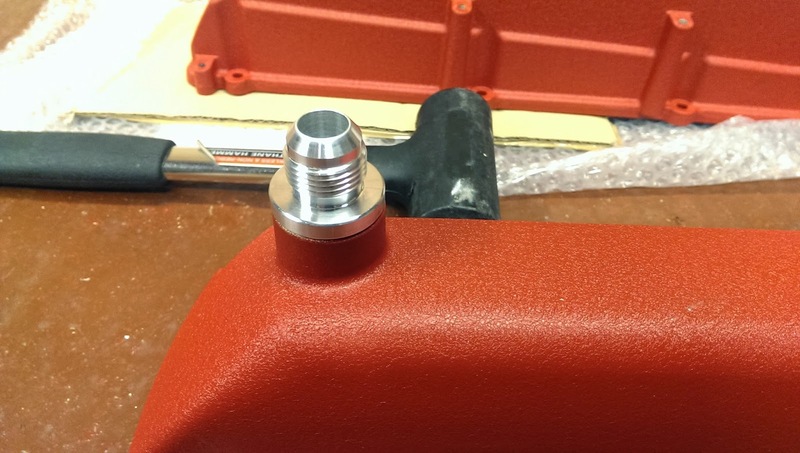 Pushing the fitting in by hand so that it lined up correctly I then covered it with a cloth and gave it a couple of good taps with a weighted non rebounding plastic hammer. 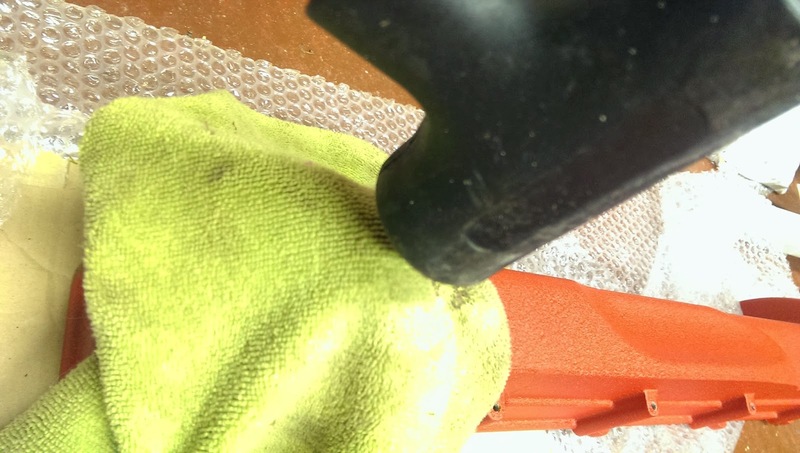 Standard 'tap' with a hammer. Don't be an oaf! 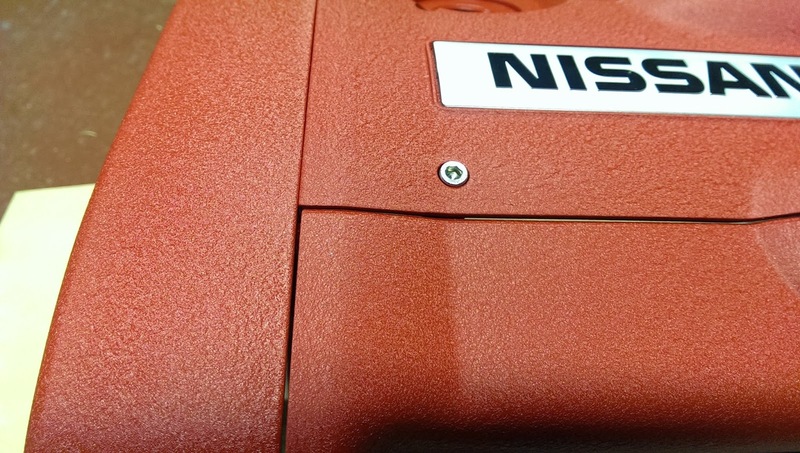 The Nissan 'Ornament' plate is a simple peel and stick item. Not hard, although very sticky! Only a problem if you have OCD like me and need all the gaps around the edge the same. Also take note of which way up you want the plate. I guess there isn't a wrong way of doing it although technically the opposite way to mine would be upside down! 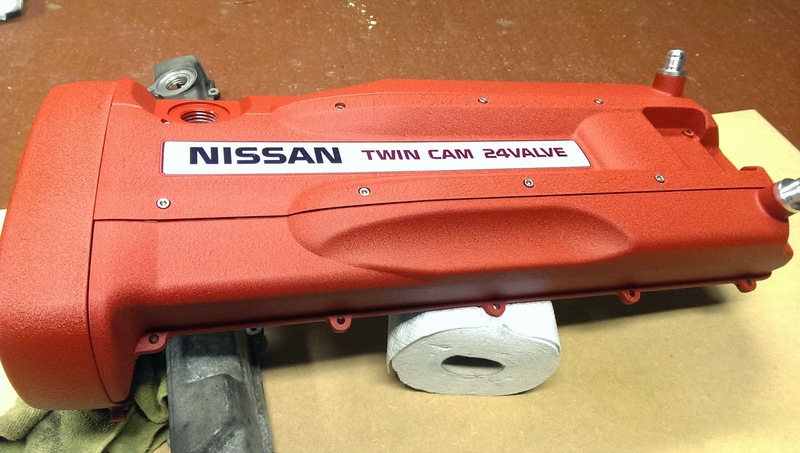 Nissan Twin Cam plate installed. Okay I have at time of writing to refit the baffle plates (Had run out of instant gasket) but think I can cope.. 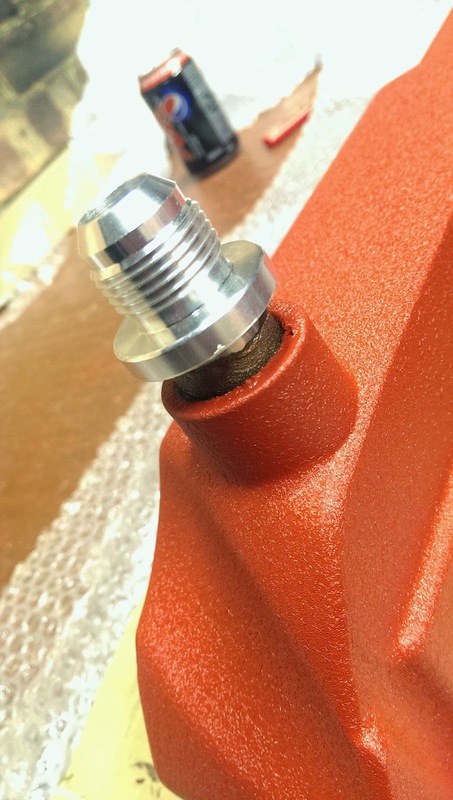 The main centre cover bolts are M5 x 25 Cap heads. Although there are two at the end significantly smaller. Here are some gratuitous shots of the finished item so far. I never get 'excited' about this 'car stuff' although am often disappointed. However in this instance I am willing to go as far as saying I'm pleased with the results. No onwards with the other multitudes of work. Next? The head is currently awaiting a trip to the machine shop, so it's time to sit around 'waiting' again. The covers look good in that colour. Better than I imagined whilst reading.